INDIA (KGO) -- It's not every day that you see an elephant wearing a sweater. 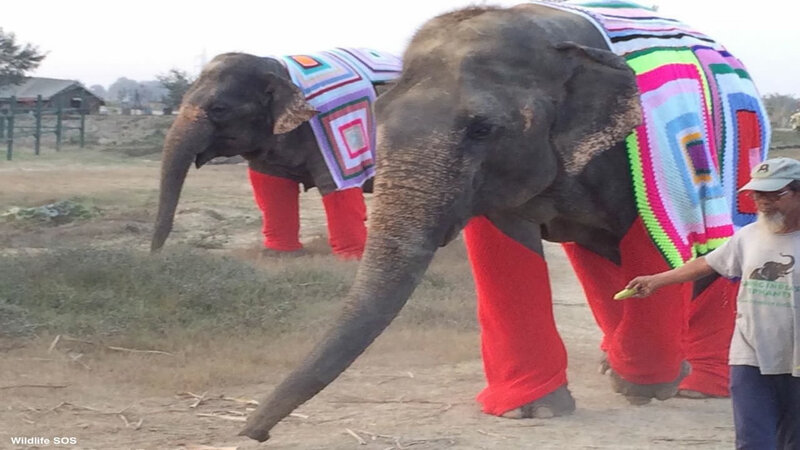 A group of rescued elephants was given the cozy clothing last week to help keep them warm after a cold spell in northern India. A nonprofit wildlife and conservation organization based there, Wildlife SOS, told ABC News that their staff members created the sweaters for the elephants living at their Elephant Conservation and Care Center in Mathura, India. There are 20 rescued elephants there. Most of them are injured, blind or recovering from injury. Wildlife SOS says they work to protect and rescue elephants from illegal captivity, trafficking, and exploitation. Many of the elephants at Wildlife SOS' facility have been subjected to extreme cruelty and decades of suffering, they told ABC News. "These majestic creatures are adjusting to a life of dignity, freedom and peace, in a place where they can spend their days happily, with frequent baths, a nutritious diet and good veterinary care," Wildlife SOS said in a news release. The center also says that the elephants' vulnerable state makes them more susceptible to pneumonia and other sicknesses. Wildlife SOS Secretary and Co-founder Geeta Seshamani added in the news release, "The rescued elephants under rehabilitation at Wildlife SOS have been rescued from shocking circumstances. We aim to provide them with a safe habitat where they can live like elephants."